In a 90,000-square-foot warehouse not far from Chicago’s Midway Airport, the future of urban farming has taken root. 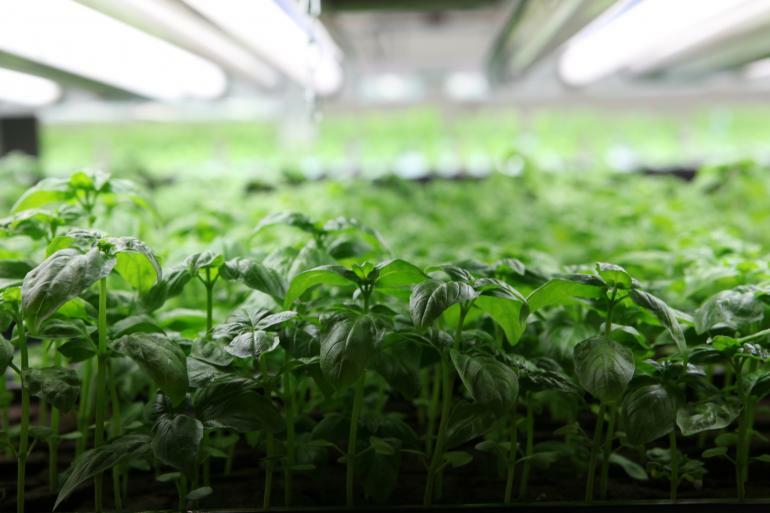 Long shelves thick with fresh herbs and salad greens sit beneath hundreds of fluorescent grow lights. There are planters of basil, watercress and kale stacked in neat rows reaching the ceiling, afloat in a nutrient-rich stream of water fed by large blue tanks filled with tilapia. It’s an eerily beautiful scene, interrupted only by the occasional worker driving an aerial lift through the aisles, stopping to pluck handfuls of greens ready to be packaged and distributed throughout the city. Welcome to the world of vertical farming. As the demand for fresh, locally grown food has increased among urban consumers, businesses like FarmedHere, which runs the Chicago warehouse, have stepped in to compete with conventional farms. Using advanced hydroponic and aquaponic methods, they’re growing fruits and vegetables year-round in facilities that are often in the same neighborhood as the restaurants and retailers they supply. Proponents like to call it ultra-local farming. “We can grow 200 percent more food per square foot than traditional agriculture, and without the use of chemical fertilizers,” said Mark Thomann, chief executive officer of FarmedHere. The Association for Vertical Farming, an industry trade group, says vertical farms use 98 percent less water and 70 percent less fertilizer on average than outdoor farms. Weather fluctuations aren’t a factor, and neither is soil management. They can harvest crops as often as 20 times a year, and with their stack-it-high layout, occupy a fraction of the land traditional agriculture requires. So efficient is vertical farming that many believe it could move beyond a niche market and become a solution for food insecurity in the United States, which affects nearly 15 percent of households, according to the U.S. Department of Agriculture. Some believe it could even be the future of agriculture altogether, with climate change negatively affecting rural farmland while the global population continues to swell. By 2050, the World Health Organization estimates, there will be 9 billion people on Earth, with 70 percent of them residing in urban areas. Read the full story via Indoor Farming: Future Takes Root In Abandoned Buildings, Warehouses, Empty Lots & High Rises.